If your a business that requires multiple copies of forms for different departments like shipping and processing you need carbonless form printing services and custom receipt books. We offer quality carbonless form printing for a variety of documents like 8.5 x 14 (Legal). All our printing jobs are custom done to suit your particular business needs to project a professional image to your clients. The advantage of working with us is that we offer 2, 3 and 4 parts forms meeting all your business needs. The carbonless copy works through a pressure-triggered release of ink from the broken microcapsules when pressed with a pen when writing. This transfers the ink on the lower side of the paper onto the paper below it; this ink reacts with a layer of clay on the paper below it to produce the color. Using custom carbonless forms designed in 3 part (triplicates) is very common as it leaves you will two copies after giving the customer a copy. This facilitates record keeping and facilitation of other activities like payment and packing of goods in the store. From as little as a copy of the carbonless custom printing can be ordered, the upper limit is open since we have robust printing equipment ready to finalize your work in just 3 business days no matter the order size. Carbon copy forms are essential in that they help in the keeping of business records associated with regular business transactions. We produce custom invoice forms, receipt pads, estimate books for contractors and many more business forms very conveniently as per your business needs. Also known as NCR or no carbon required, carbonless printing takes away the hassle of ensuring the carbon paper is in place every time you want to write on the form. It is neat and professional. Our custom work allows you to use your logo and avoid the generic company look for your forms. This helps a business stand out and be noticeable in a highly competitive market. Enjoy the power of first impressions and be easy to find and separated from the rest. You do not have to use the messy carbon papers anymore for your business transactions recordings. If you need help ensuring your forms are of the correct layout and size, our team of designers are at your disposal. We can print a variety of sizes including 8.5 x 14 (legal), 8.5 x 5.5 (1/2 sheet letter), 8.5 x3.6 (1/3 sheet letter), 4.25 x 11 (1/2 sheet letter vertical) and 4.25 x 11 (1/2 sheet letter). With your business in mind, we can design and print the correct custom carbonless forms. We have very experienced graphic designers who will actualize all your imaginations or we can send you a basic template. They understand the importance of quality work both to our business and to your business image. Call Top Class Signs and Printing today! 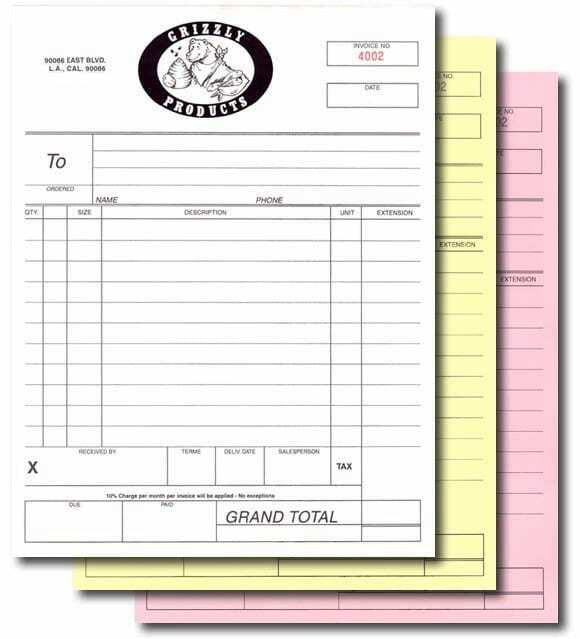 In addition to the different sizes and options to customize shape and color of the carbon copy forms, we can also punch holes to make them easy to hang and also offer the standard shapes and sizes on 100% recycled paper so that you practice a green business while still appearing professional to your customers. You can choose full-color carbonless form printing, 2 color ink or black for the receipt pads, custom invoice forms and other forms you may need. You can choose a form stapled into a booklet or available in loose sets with a chipboard pad for mobility while using it. As a finishing, a customer may request for the pages of these custom forms to be numbered serially in red or black ink. Carbonless forms (use several times) can be printed from your designs on file but even if you don’t have any designs, our many templates. With the help of our designers, you can come up with your desired form within no time. Whatever the quantity, size and design of custom receipt books you may require, we can design and print it in 2prt, 3 part or even 4 part for your business use and convenience. We have the best prices, a strong support team and the fastest turnaround time in the market. If you need blank carbonless paper produced for your use, we will do it. There is no printing need we cannot do when it comes to NCR printing. Customization is the way to go if you are to stand out and be different. If customers are to remember your business then customize your forms colors, shape and size instead of using the standard designs that all look the same. If your in Miami Florida or Doral area you can pick them up in a few days or stop in and see samples. Order your forms today in our online store.